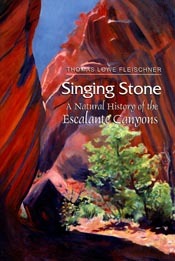 Integrating personal narrative and natural history, Fleischner presents what he calls a "guide to understanding" the relatively unknown landscape of the Grand Staircase-Escalante National Monument. Like a bright blue seam incised deep in solid rock, the Escalante River binds the fir forests of Utah’s High Plateau with the barren deserts of the canyonlands region in the newly designed Grand Staircase-Escalante National Monument. To this wild landscape, naturalist Thomas Fleischner brings both emotional engagement and a wealth of knowledge. With unabashed passion and patient and learned observations Fleischner presents this relatively unknown landscape. Singing Stone is ideal for curious visitors to the national monument as well as students of environmental studies. Fleischner’s background as a conservation biologist and former park ranger, a professor of environmental studies, and a naturalist in the Escalante Region for almost twenty years has provided him with a deep reservoir of experience and knowledge. The book’s first three chapters survey the unique geology, flora and fauna, and human history of the region. Chapters four and five trace the more recent impacts of human activities—grazing and wilderness recreation—and explore the shifts in cultural values and public policy that have occurred as a result. Examining these topics in the context of a specific landscape offers a lens through which these changes, now the topic of examination and controversy throughout the New West, can be clearly seen and, hopefully, re-evaluated. Thomas Lowe Fleischner’s articles and essays on topics pertinent to western ecology have been widely published in journals such as Conservation Biology and in books including The Encyclopedia of Ecology and Environmental Management. "More Beauty Than I Can Bear"
4. Home on the Range?